production ramp-up from new customers. There may be upside to our forecasts, as we have not factored in contributions from Huawei and a second project AEM is involved in for its core customer, a USD215b market-cap chipmaker. Initiate with BUY with ROE-g/COE-g Target Price of SGD1.21, based on 2.9x average 2019-20E P/B, based on 2019-20E average ROE of 27.3%, COE of 10.6% and LTG of 2%. Our Target Price implies 2020E EV/EBITDA of 5.2x, vs. peers’ at 9.6x. 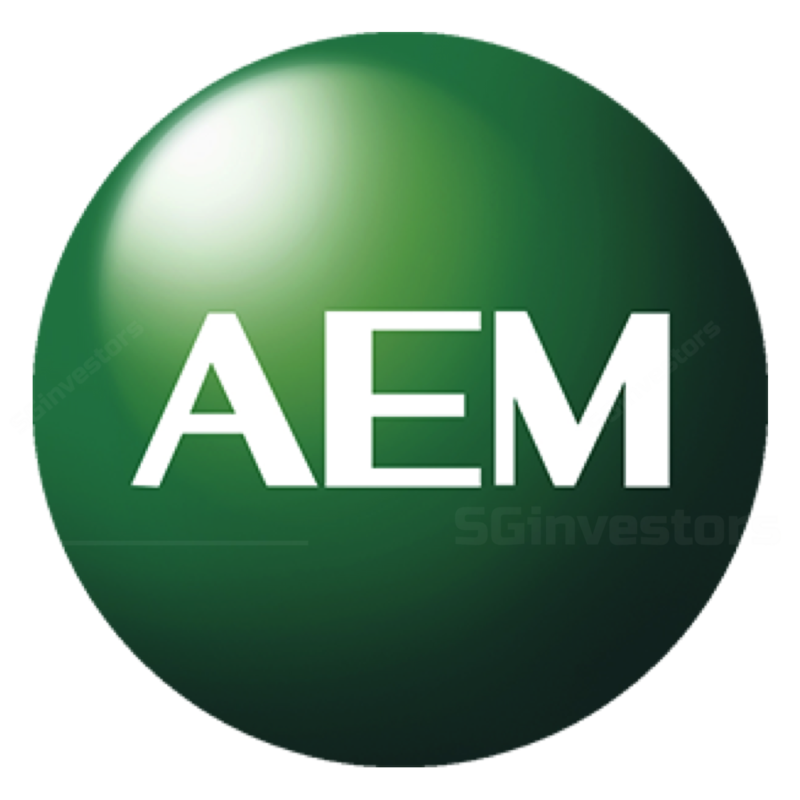 AEM HOLDINGS LTD (SGX:AWX) specialises in semiconductor back-end handling and testing solutions. It began co-developing HDMT THs alongside its core customer in 2013. A strong volume ramp of these handlers in 2017 caused net profit to swell 6.7x to SGD31.5m. It has four production sites, in Singapore, Penang, Suzhou, and Finland. AEM’s major customer is a USD215b market-cap chipmaker which contributes > 90% of revenue. While AEM is diversifying its revenue streams, we expect this core customer to continue contributing the lion’s share of earnings during our forecast period. Since FY17, the mix of its machine and consumable sales has approximated 50:50, in part because each piece of equipment is usually shipped with a corresponding set of consumables. However, as AEM installs a wider base of equipment over the years, its product mix should increasingly skew towards higher-margin consumable sales. Much of AEM’s direction and execution has been influenced by its chairman, Mr Loke Wai San. He became chairman after his PE fund, Novo Tellus Capital Partners, took a substantial 16.6% stake in 2011. Since then, Mr Loke has been instrumental in the restructuring of the company, the co-development and production ramp-up of HDMT handlers and integration of M&As. AEM has bought three companies since 2017, both vertically and horizontally along the value chain. 4.2 % is owned by foreign investors and held in proxy by Novo Tellus, as the investors do not have a Singapore central depository account. Mr Loke’s latest known stake was 2%. High Density Modular Test or HDMT is a test framework pioneered by AEM’s key customer. It was meant to overcome increasingly burdensome testing costs under the traditional testing framework, as chips become increasingly complex to test. AEM’s customer claims that HDMT has helped it cut costs by twice its original target. Traditionally, chips were designed to be tested by testers known as automated test equipment or ATE. Under this “serial” framework, test costs have become increasingly prohibitive. This is due to the rising complexity of mission critical chips, low throughput due to set-up down time and increasingly expensive ATE price tags. HDMT resolves this by taking a modular and massively parallel approach to chip testing, which helps to achieve throughput levels that are not possible under the traditional framework. The catch is that for a chip to be tested under HDMT, it must be designed to be capable of built-in-self-test at the system level. While this means greater costs incurred at the chip-design stage, this test paradigm has so far been a more economical and effective approach for AEM’s customer. Overall, AEM believes that its relationship with its core customer is sticky. AEM has patent rights to the HDMT handlers. AEM believes future chips from this customer will be mostly designed for testing using HDMT technology. These handlers have been deployed in its R&D labs. The HDMT handlers can efficiently consolidate multiple test stages – from burn-in and class to system tests - in a single stage. This allows the customer to shrink its fleet of over a thousand handlers from legacy providers and shift allocations to AEM. AEM is able to meet its core customer’s stringent demands in engineering and global field service support. It is able to copy exactly its manufacturing requirements. Its core customer historically incentivises its key technological providers to invest in R&D by appointing them as sole suppliers. AEM believes the current scenario is no different. In similar fashion, AEM believes other chipmakers could benefit from the economic proposition of HDMT. In response to this perceived market opportunity, it has launched AMPS. This operates on a similar modular and massively parallel test framework. However, end-customers for AMPS will likely be chipmakers that are not in direct competition with its core customer, to avoid conflicts of interest. Following an aggressive production ramp-up of HDMT THs in 2017-18E, AEM HOLDINGS LTD (SGX:AWX) has guided for more-tempered demand from 2019E onwards, as the “operational fleet replacement” phase of the core customer’s fleet of test handlers begins. However, deliveries will likely pick up in 2020E. This is because the expected completion of the customer’s USD5b capacity expansion in Israel could result in a rise in orders for HDMT THs. Another catalyst could be new chip launches by the key customer, especially those manufactured on the customer’s new 10nm process. All things equal, management believes chips manufactured on the new 10nm process will likely require more testing as compared to chips manufactured on the matured 14nm process, due to reduced familiarity with the new node. multiple sources of earnings growth in 2020E, including from a recovery of HDMT equipment orders. Our expectations of HDMT equipment order recovery in 2020E accounts for around 45ppt of the forecasted 63% rebound in revenue. While we will likely have to update our forecasts when management provides 2019E guidance, we believe our expectations for revenue to fall by 36% in 2019E is a reasonable estimate, taking cue from a 30% reduction in production capacity following recent layoffs. In our bear case scenario, where we unrealistically assume AEM does not secure any more orders beyond the current SGD110m for 2019E, we expect the company to still turn in a profit of SGD4m (-89% y-o-y). Thanks to AEM’s strong execution with the core customer, AEM has been selected to work with the customer on other initiatives, including a next-gen hybrid solutions product. We believe the strong learning curve from AEM’s relationship with this customer could enhance AEM’s capabilities as it continues to diversify and deepen its offerings. At the same time, we believe that the customer’s competitive advantages are broadly intact. For starters, the customer has affirmed that progress on its 10nm process remains on track. The customer’s R&D budget of USD13b (21% of FY17 sales) is also heads and shoulders above its peers. Despite a softer than expected 2019 outlook, the customer is still steadfast in increasing capex for its logic chips, and remains committed in focusing R&D on data-centric solutions, to forge and strengthen competitive advantages in these areas. The customer has expanded into other products, which include automotive, programmable solutions, memory and modem chips. To-date, AEM has made three acquisitions amounting to SGD17m, and also launched its in-house test handling solution called AMPS. With these, AEM has secured at least three new customers. While contributions are expected to be nascent in 2019E, AEM expects production ramp-ups with these customers to add on to the 2020E recovery. an automotive customer for InspiRain. According to AEM, Afore’s MEMS wafer-level test-handling technologies are several years ahead of the industry, and are able to radically reduce the cost of testing MEMS. Refer to the attached 26-page PDF report for detailed analysis. Our ROE-g/COE-g Target Price of SGD1.21 is based on 2.9x average 2019-20E P/B, in turn based on 2019-20E average ROE of 27.3%, and LTG of 2%. We have used average 2019-20E BVPS to arrive at our Target Price as we believe this would capture the accretion from the expected hockey stick earnings recovery in 2020E earnings. As AEM is a cyclical company, we believe the ROE-g/COE-g methodology helps us infer an appropriate valuation for AEM, vis-à-vis its ROE profile. We have not captured any ROE accretion from potential contributions from Huawei and the next generation hybrid solutions that AEM is developing for its key customer. We believe our Target Price is reasonable, as it implies 8.2x 2020E P/E, for earnings growth of 133%, while global test handling peers are trading at 11.7x for growth of 33%. On a 2019E basis, our Target Price implies 19.1x while peers are trading at 14.3x. If our base case scenario plays out, we expect AEM’s cash position to account for 27% of its market cap by 2020E. This implies that AEM is currently trading at only 4.5x ex-cash 2020E P/E. Refer to the attached 26-page PDF report for detailed financial analysis on AEM’s P&L, balance sheet & cash flow. AEM’s share price may be volatile in 2019, especially considering the softer than expected outlook of its key customer at its 4Q18 earnings briefing. However, disclosures by the customer suggest that the weakness is transient, and that its secular prospects are intact. Moreover, given the earnings tailwinds we see for AEM in 2020, we would be BUY-ers on dips.